A few years ago, it might have felt like the stuff of science fiction, but beacon technology built on BLE (Bluetooth Low Energy) communications has the potential to change the way we shop and live. Imagine installing an app on your BLE-enabled mobile device, going to a store, and being able to view information about products by tapping your smartphone or tablet to a small beacon devices placed all around the store. Or receiving special discounts because it’s your first time in that location. Or your Nth. Or going to a baseball game and being able to see on your phone which concession stand has the shortest line. Or being at an airport and getting flight information on your device, including cancellations, directions to gates and more. This is what beacon technology is promising consumers, and according to the Washington Post, the economic impact worldwide could be worth trillions of dollars. What Are Beacons and iBeacon? What is BLE? What is Geofencing and IPS? Beacons are small-form factor (as small as an American quarter) sensor devices built upon BLE (Bluetooth Low Energy) technology that are networkable and thus can communicate with each other, as well as nearby Bluetooth-enabled devices (phones, tablets). Devices will require a suitable mobile app, and for which the device owner has opted-in to receive a variety of messages, depending on the organization. (More about this below.) BLE is a new communication protocol based on an old wireless communication technology, Bluetooth. Alternately, it’s known as Bluetooth 4.0 and Bluetooth Smart. •	It has relatively long-range communication ability compared to NFC (Near-Field Communication), which is many Android phones as well feature phones and smartphones long in use in parts of Asia and Europe. •	It uses relatively low levels of power. A battery as small as an U.S. nickel can power a BLE device for year, maybe more. Some BLE beacons devices are claiming from 2-5 years on a single charged battery. •	BLE device form factors are very small and will be usable in wearable tech. •	BLE devices can potential connect anything, including common everyday objects and clothing (backpacks, bikes, blue jeans) without needing to be charged. •	This means that by 2022, the average number of connected devices per household could increase from about 10 (as of Jan 2014) to 50 — including BLE and non-BLE. When three or more BLE beacons have been placed in an area and are networked, a virtual perimeter known as a geofence is created. This geofence is purely conceptual and manifests digitally by detecting where an opted-in mobile device is an store using triangulation. This ability for micro-location awareness holds a lot of potential promise in improving the shopping experience. iBeacon is not a physical object. It is Apple’s software implementation of beacons as of their iOS 7 mobile operating system — which debuted in fall 2013. iBeacon technology, referred to as an Indoor Positioning System (IPS), is specifically for use with Apple devices, while physical beacons have the ability to communicate with any suitable BLE-enabled device (which also includes laptops and other devices). From an Apple.com support page, iBeacon technology works with the following Apple mobile devices, all of which must be running iOS 7 or later, and have Bluetooth turned on in the settings. •	iPhone 4S or later. •	iPad 3rd generation or later. •	iPad Mini or later. •	iPod Touch 5th generation or later. Android devices having OS version 4.3 and later will support BLE. This means that they’ll work with some iBeacon-based beacons as well as beacons made specifically for Android use. Note that for micro-location awareness to work, mobile devices will require specific apps to be downloaded, as well as have “location services” enabled — something that most apps will prompt users for the very first time an app is used. Companies building beacon devices (some of which support iBeacon) include PayPal, Qualcomm, Datzing and Shopkick. The average beacon, depending on manufacturer, runs about $100, at the time of writing, but is expected to come down with wider adoption of BLE-based sensors. Why Use BLE Instead of GPS or NFC? GPS (Global Positioning System) is not meant for indoor micro-location use, being inaccurate for distances of less than 30 feet. NFC, while used for years as part of payment technologies in mobile handsets in parts of Europe and Asia, is the opposite GPS in that it can only work for very short distances. NFC range is theoretically 20cm or less than 8 inches, although optimal distance is 4cm or just over 1.5 inches. While BLE-based sensors are more expensive than NFC chips, their range is up to 50 meters or just over 164 feet — making for more versatile use, including the aforementioned micro-location awareness. 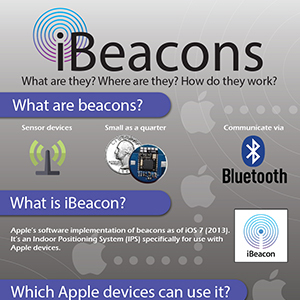 Where are iBeacon Beacons Being Used? •	Apple Stores — Apple rolled out iBeacon use in all 254 of their U.S. Apple Stores, starting in Dec 2013. What Apple is doing in their Apple Stores is essentially a live demo of some of the capabilities of iBeacon technology, which includes: alerting opted-in customers of certain products near where they’re standing; notification that an item is ready for pickup at the front desk or other part of the store; recommendations of accessories, software and other products based on the types of Apple devices owned, etc. •	Giant Eagle and Safeway — A 200-plus store rollout was announced in Jan 2014, for locations in Seattle, San Francisco and Cleveland. •	MLB stadiums — Over 20 MLB ballparks were expected to each install 100 iBeacons by Opening Day 2014, Mar 22nd. •	NFL stadiums — iBeacons were used for the NFL Super Bowl XLVIII. Some of the above — for example, Macy’s — use iBeacons but simultaneously support Android devices (running the 4.3 OS or later). Effective use of beacon technology requires consideration of where sensors are positioned, depending on the shape and size of an location, as well as the materials used in the construction of the building. There are many consumer experience scenarios that can be improved by beacon technology and micro-location awareness. Some of the uses listed below are either already implemented, about to be implemented, or could potentially be implemented. •	Can be used to offer short-duration discounts to nearby shoppers. •	Incentives at gas stations, car dealerships and more. •	Beacons can be tapped by a mobile device, after which the device would receive information about the products on a given shelf. This is the feature that surveyed consumers are most interested. •	For ticket holders, a mobile view of their tickets, directions to seats in a sports stadium or to the shortest concession lines. •	Customized welcome messages, with on-demand specials. •	Customized exit surveys, with incentives for your next visit. •	Digital coupons pushed to a customer’s mobile device based on where they are in a store — such as in a specific grocery store aisle. •	Links to reviews of a particular alerted-to product. •	Digital personal shopper, with custom recommendations based on previous shopping history, including online shopping behavior — if a consumer has opted-in. •	Access to full issues of digital magazines for patrons of coffee shops, doctors and dentist offices, and more. •	Automated mobile tour guides in museums and other places. •	Control of home automation based on your presence. •	Toys that can react to each other’s location. This is a legitimate concern, especially for technology that knows where you are, so to speak, within certain areas. Security is what each retailer and other organizations make it, for their respective apps. Consumers should preview what an app collects or not before using them. There are also concerns by some privacy advocates that beacon devices could be cloned or spoofed. Given that there is speculation that Apple will build a mobile payment system on iBeacon, these security concerns need to be demonstrably dealt with and protected against . There will be kinks in beacon technology to iron out in early stages, and that means that customers will initially be frustrated. Other hurdles include the multiple layers of permissions that are required for micro-location awareness, including turning on Bluetooth on a device, accepting location services from a specific app, opt-in for marketing notifications. Regardless of the type of beacon technology, however, the potential for improved experiences in shopping, entertainment, travel and other purposes will likely create enough demand that these technologies will be smoothed out sooner rather than later — after which consumers will possibly wonder how we ever got along without these micro-location-aware experiences in our everyday lives.